Guides, Safety Boaters, Kayak Guides, Kayak Instructors 2015 - 2016 Season. Our Guide Team: Selecting our team is one of the most important jobs I have.These are the characteristics we selct for. 1. Chatacter: Passion and Diversity: We want good peoplefrom diverse countries that love what they are doing and love being in Futaleufu. 2. Experience: Nothing prepares one for the Futaleufu liked our intense Exchile guide training on the Futaleufú. However we want you to have previous Class 4-5 experience. Swiftwater rescue and guide certificates are required. We want our rafters to be kayakers also. This dual relationship with the river allows our guides to understand the river in a more intimate way. 3. Education: We like educated curious guides that understand that this is a unique opportunity to interact with guests and fellow team members from different cultures and parts of the globe. We like you to be able to discuss more than the river. 4. Athletes: We feel athletes understand training, taking care of ones body, and hard work. Athletes have adapted faster to the incredible challenge that our Exchile Futaleufu training program presents. Recreational drugs are not tolerated. 5. Heros: We want the guides to grow and push themselves while keeping our clients safe in this incredibly challenging environment. If the clients report that they had the best two weeks of their life our Exchile team has succeeded. If the guides report the best summer of their life we have succeeded. Adam is the Exchile River Manager. He was a child prodigy in the sport of kayaking at 9 years of age in England. He received a grant from the government of UK to seriously pursue kayak as a sport. He competed in freestyle kayaking and traveled the world. He has spent 4 years rafting on the Futaleufu and has guided in Nepal, Norway, France, Austria, Zambia, and BC Canada. He is a patient, caring, cautious and calm leader. He has more miles on the Futaleufu for his age than anyone, and it shows with his magically effortless moves in a kayak or raft. He is respected by our guests, our guide team and our support team. He is our cooks favorite for his helpfulness in the kitchen. On the river you will see why he is in charge of river safety. He is at home in a raft on Class 4-5 whitewater as he is teaching kayaking on class 2-3. John is the Exchile head rafting guide. John majored in Outdoor leadership at Prescott college. John is made for Outdoor leadership and it shows. 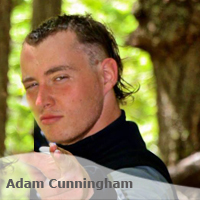 He is a Class 5 oarsman, kayaker and an avid outdoorsman running rivers throughout North America. His work ethic is unsurpassed. He is enthralled by the Futaleufu and is a master of preparing his raft guests to work as a team for the safe navigation of the challenges. His all out attitude is contagious. He is powerfully built but he will surprise you with his blue eyes, soft voice and and masterful guitar playing. He was raised in the Boston area and resides during US summers in Missoula Montana. 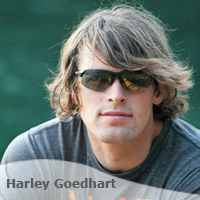 Harley is an Exchile kayak, sea kayak and raft guide. He was raised in Declo Idaho a couple of miles from the Snake River. Harley has an electrical engineering degree from Idaho State University where he was on a scholarship as a decathlete on their track team. He placed second in the Decathlon in the Big Sky Conference Championship. 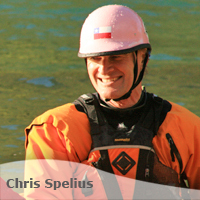 When he was 10 years old he visited the Futaleufu and was taught kayaking by Chris Spelius. Although great athletes often are not known as great teachers, Harley is the exception. He is a superb kayak and roll teacher. Harley is 6 ft 4 and is agile on the water as he is off. Harley knows how to work and knows how to listen. He installed our solar system and consulted on a micro hydro project. 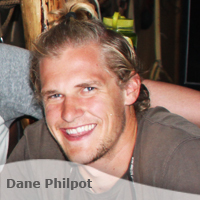 Dane is an Exchile kayak, sea kayak and raft guide. While in high school in Salt Lake City Dane was a Utah State champion in backstroke. He now has a degree in Architecture from California Polytechnic State University where he swam in the Pac 10 championship meet. He is 6 ft 4, with a swimmers build that is ideal for the big water on the Futaleufu. Chris Spelius taught Dane to kayak when he was 14? years of age. Dane now is a class 5 oarsman on the Futaleufu and is as agile on the raft as he is in his kayak. He also is our video editor and drone pilot. His people skills are exceptional. Dane loves paddling the Class 5 Throne Room and paddling into our eco camp to share an evening with our guests. He is trying to balance his love for rivers with his career. This season our guests were fortunate that the teeter totter tilted towards Exchile. 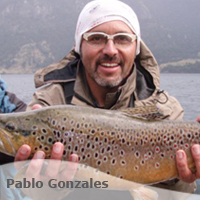 Pablo has been a long time fly fishing guide, bike guide, sea kayak guide and kayak instructor for Exchile. Pablo was born and raised in Chile. He is a graduate of the prestigious Universidad Católica in Languages: English and American Literature. He taught at the Chilean North-American Institute in Santiago, Chile for a few years, but at the age of twenty-four he traveled to the United States to get involved in the whitewater kayaking scene and outdoor recreation industry, something that was new in Chile in those days. 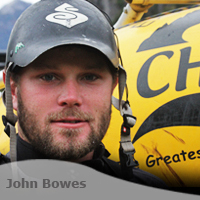 He is certified in Swiftwater Rescue (CATA) and has his guide's license for class IV-V whitewater. Pablo has been trained under the ACA Kayak Instructor Curriculum in North Carolina. For the past six years Pablo has been the owner of his own adventure travel company, GradoSur Expediciones, based out of Santiago de Chile. Pablo is fluent in both Spanish and English, so if you are lucky enough to have him as you instructor or river guide you will really have the chance to see Chile from a native perspective and meet some of his local friends. You might also discover his guitar playing, as he is the instigator of many of our après river activities. Gonzalo is a horseback and trekking guide. 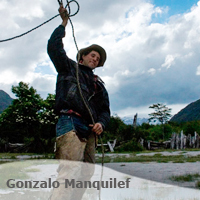 Raised in the remote area of the upper Espolon river Gonzalo is the true mountain man Gaucho. He knows the valleys and passes, the plants, birds and wildlife. He knows the neighbors at the remote ranches that are off the grid where we may stay. This is where he grew up and he has a lifetime of training with horses and wilderness living. He rides in local Rodeos. We feel he is a heroic horseback guide. 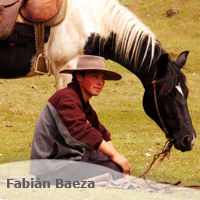 Fabian is a horseback and trekking guide. Raised in the village of Futaleufu Fabian is a lifelong horseman and experienced in wilderness living. He was taught by his legendary dad Turibio Baeza. He also graduated from an outdoor guides school in Chile. Fabian is bilingual, and is a very fun guy to be on a trip with. He is a favorite with our guests. Chiloe is an Exchile guide intern. 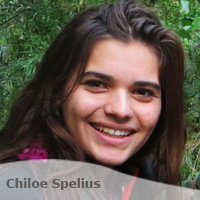 Chiloe is a dual citizen of Chile and the USA and is fluently bilingual. She was raised in Futaleufu and started kayaking, horseback riding, and competitive swimming at 5 years of age. In 2014 at the Chilean National Swimming Championships she won silver with a second place finish in the 100 meter Butterfly. She says, water is her medium. Chiloe now paddles class 4 whitewater and is looking forward to paddling class 5 this upcoming season. She has perfect rolls and can teach them. She assists with our kids clinics. Her ability to relate and communicate with our guests is impressive. She also has accompanied our advanced horseback trips as a guide helper, interpreter, and satellite phone operator. She recently has made the decision to be a full time scholar - athlete, and is studying and swimming as a sophomore at the Community School in Sun Valley Idaho. Science is her favorite field. She is a member of her schools Outdoor Leadership Academy. She now makes, appearances in Chile as an intern guide during Christmas and Spring breaks.